I bought this rack pack at the same time I bought the Donruss pack as it was on sale for just $4. Again I was hoping to pull one of the Jimmy Howard cards from the set, but no luck again. I really have to stop buying these things and just look for singles. There is a lot going on with these base cards, and that is definitely not a good thing in this case. Does the O-Pee-Chee logo really need to be that big? It takes up way more space than it should, leaving little room for the actual picture on the card. I didn't get any inserts this time, but I did end up with two parallels. 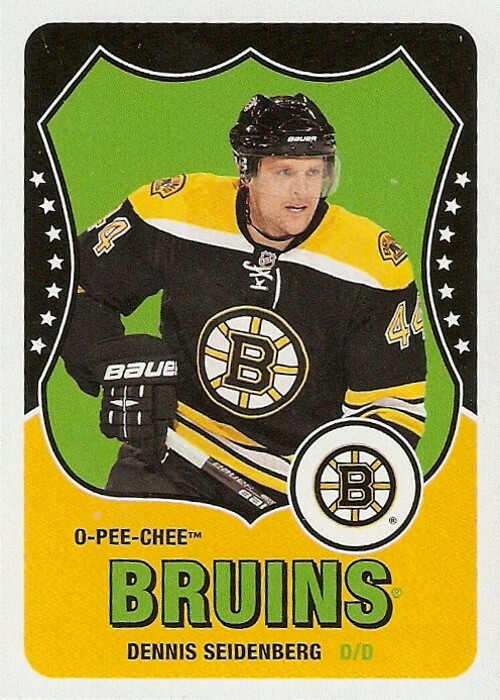 The first was this Seidenberg retro parallel. These are much better than the base design, at least the large part at the bottom is the team name and not the name of the set. 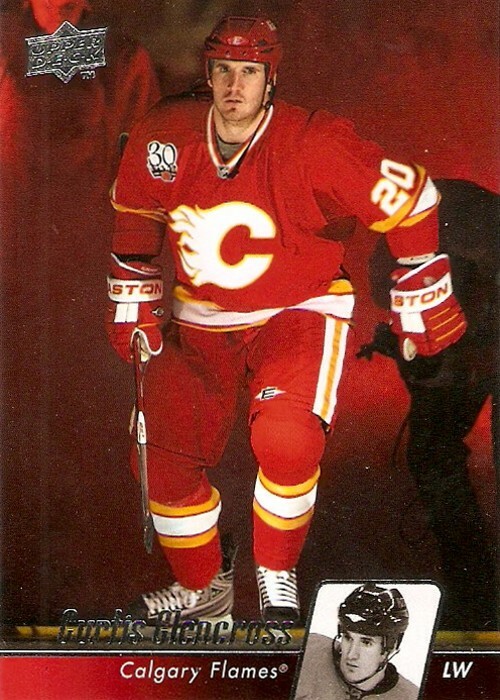 In addition to the Seidenberg, I got a Giordano rainbow retro parallel. It's the exact same as the regular retro parallels, except for the rainbowy glossiness on the front. They could have done better with the picture on this one though, that's for sure. Again, this wasn't all that bad considering it was on sale. When it comes down to it, I would definitely pick Donruss over this any day. I just can't get over the huge O-Pee-Chee logo and the tiny pictures on the fronts of these cards. I've been trying to buy at least a pack of every product this year, except for the high end stuff (i.e. Limited). So far I've only busted some Score from Panini, so I was looking forward to Donruss. I came across some rack packs at the local Meijer store for $4.99, so I thought why not? As a bonus, all of the trading cards were 20% off so I really got this pack for $4. I didn't expect to get anything spectacular and I was really just hoping to pull the Jimmy Howard base card, but that didn't happen. I got all base except one card and I must say they're pretty nice looking. I like the old school Donruss logo. I also like how there is nothing covering any main part of the picture. 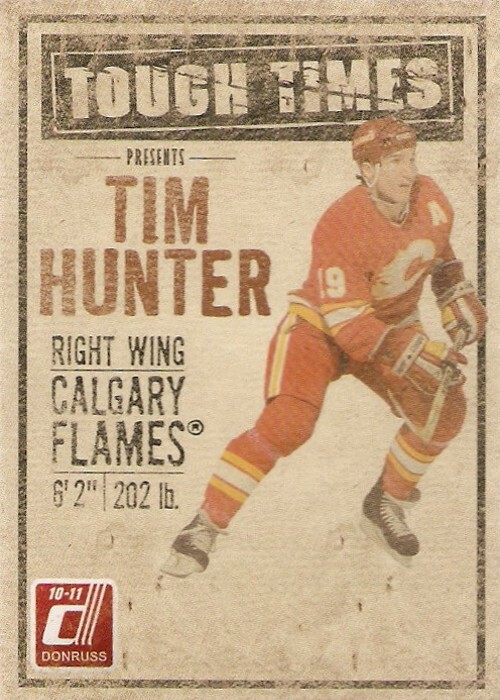 The one insert I got was a Tough Times Tim Hunter. There is just something cool about these cards. I really like the rough look they have. 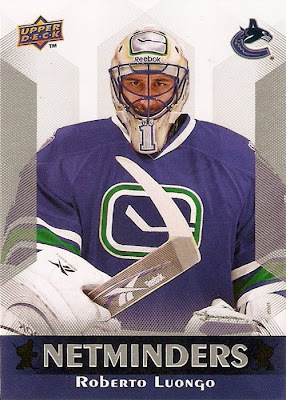 The only negative would be the open space at the bottom of the card where a sticker auto would go, it just looks kind of odd. This one wasn't too bad, considering it was on sale. 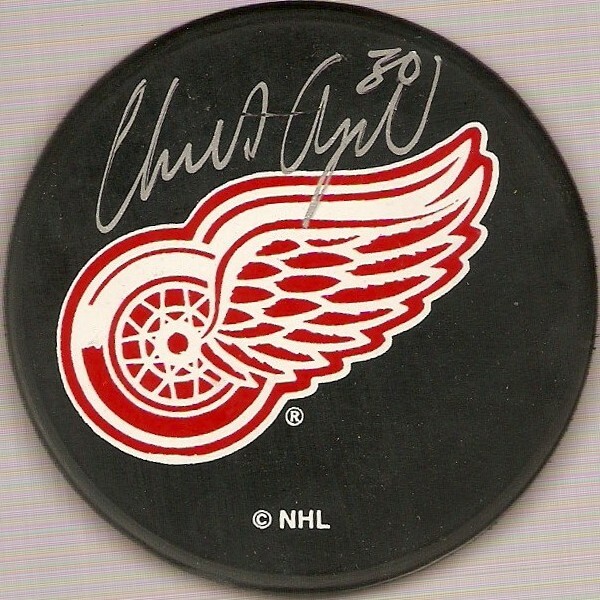 I would have liked to get the Jimmy Howard, but oh well what can you do, I'll just have to look for singles as usual. The photo on the card was taken at about the 5 second mark of the video. There's another good look at about the 13 second mark. 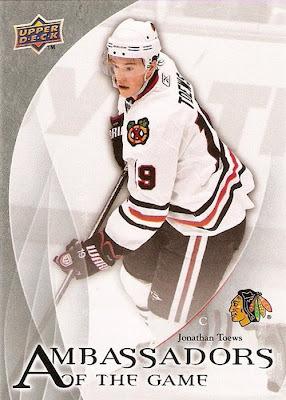 I chose this one because it's just another base card, like the Johan Franzen from the first post in this series, that happens to feature a specific highlight. These are harder to come across because most cards just have pictures of the players skating around. They also beat any of the game dated cards because those ones are supposed to have this kind of moment on them, while these plain old base cards just happen to. These were the two rack packs I received as Christmas gifts. The last one of these I bought wasn't all that bad, so it was a nice surprise to open these with the rest of my gifts. Here are a couple of the better base cards from the two packs. 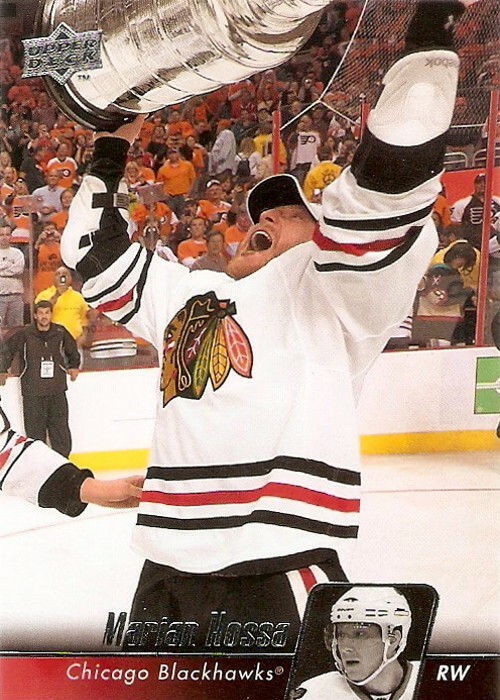 I find the Filppula interesting because it uses a picture taken from the 2009 Stanley Cup Finals. Why didn't they have something from last season? Then the Hossa is just nice because it's a card featuring someone with the Cup. As far as inserts go I got the usual inserts. Two were Netminders of Kiprusoff and Varlamov. I am just having no luck pulling the Howard from this set. I'm starting to like these a little more as I get more of them. I just wish they focused more on the masks. 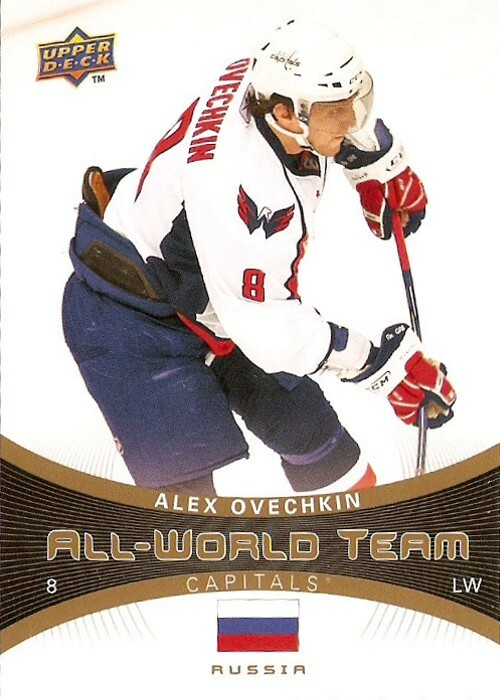 The other two inserts were Ovechkin and Toews Ambassadors of the Game. These aren't my favorite insert in the world, but they could have been worse. 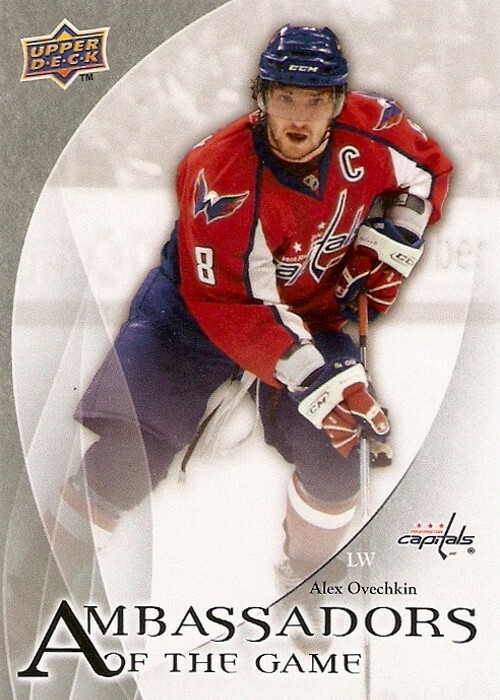 At least I got another Ovechkin, that works for me. I think I am going to stay away from any more rack packs of this stuff and just look for the Howard singles I need. That should be much easier, faster, and cheaper. 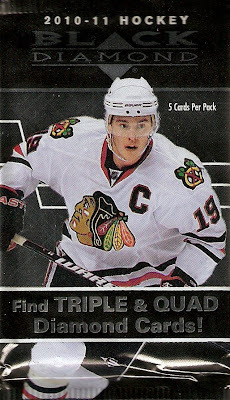 In addition to the UD series one blaster box and rack packs, I got three packs of 2010-11 Black Diamond. They all came packaged together in one blister pack. I've seen a lot of Black Diamond breaks on the forums and I wasn't overly impressed with the results, but hey I can't complain, these were gifts. I ended up getting nothing but base in the first two packs and a no-name rookie in the third pack. 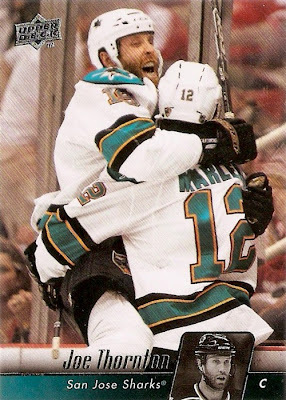 This Martin Havlat is your typical base single diamond card. The design isn't too bad overall, it's just impossible to get these things to show up on the scanner the way I want them to. This Jonathan Towes quad diamond is probably the most valuable card I pulled from the three packs. The only difference between this and the Havlat is the actual number of diamonds on the front of the card in the upper left corner. It's almost impossible to read, but this rookie gem features Dana Tryrell of the Tampa Bay Lightning. Never heard of him, but hey a rookie card is a rookie card right. Tyrell was Tampa's 47th overall pick in the 2007 entry draft. Not bad for three packs. I don't see myself buying any more packs or boxes of this stuff though. The only reason I want anything further to do with Black Diamond is the Jimmy Howard base and parallel cards. This is the blaster box of 2010-11 Upper Deck Series 1 that I was referring to in my last post. 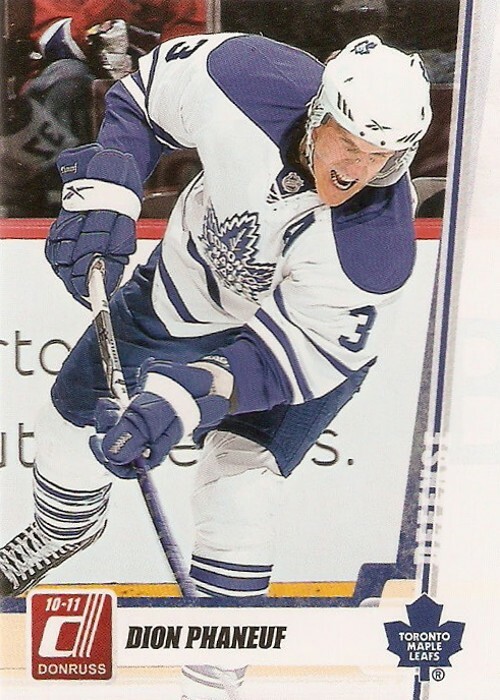 As far as Christmas goes, I love getting hockey cards as gifts, because I don't have to be upset if I don't get a hit as I didn't actually pay for it. There were plenty of great looking base cards in this box, but this Curtis Glencross stood out. It features an awesome non-action shot of him entering the rink. Photography is one thing you can always count on being good from this set. 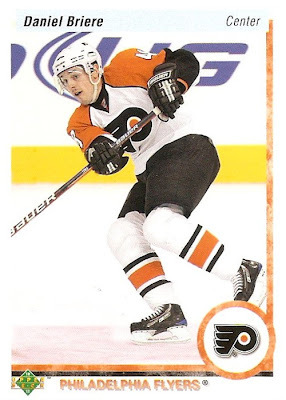 This Daniel Briere was the only retro parallel I got. I really like these cards, as they look and feel exactly like the originals from twenty years ago. They're even printed on thin, non-glossy card stock. Now I just need to find the Howard version. 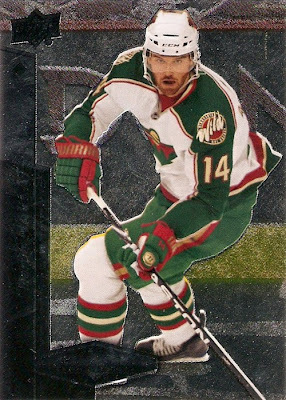 I'm not sure what the point of this EA Superstars insert set was, but they actually don't look all that bad on the front. I really like the background and the different textures. 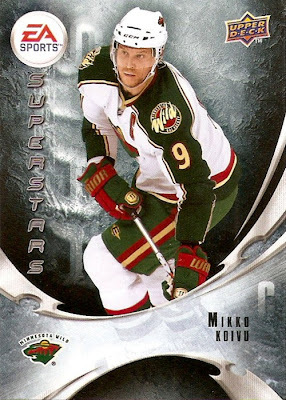 This Mikko Koivu was the only one I got. This All-World Team card is from another one of those low-end insert sets, but at least I got one of the best possible players in the set. The design is ok, I actually like the font used on the All-World text and the gold & black color combo. 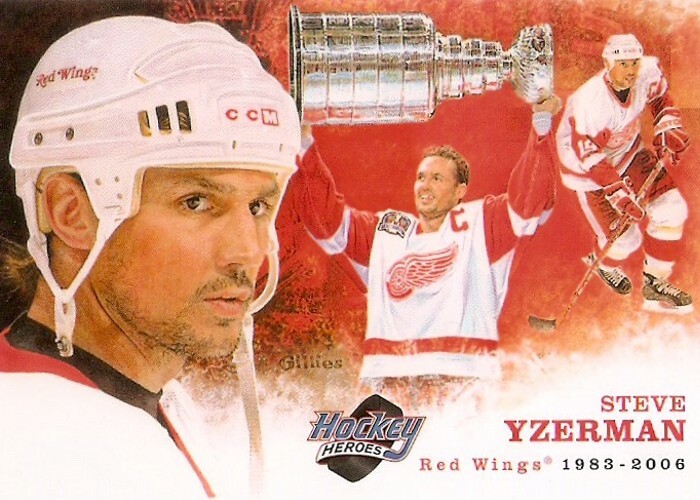 This one is the sixth card in this year's Hockey Heroes set featuring Steve Yzerman. It looks the same as previous sets with the large encircled player image and the Hockey Heroes logo in the bottom right corner. Definitely a keeper for my Wings collection. 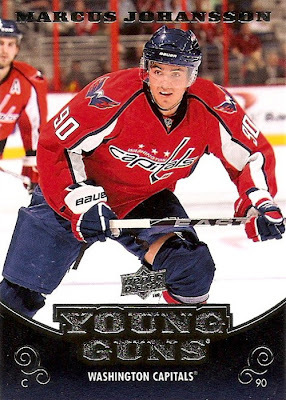 I was happy to get one of the prized Young Guns, although it's not one of the higher end rookies from this year (i.e. Hall, Subban, etc. ), but that's ok with me. At first I wasn't a fan of the design for this year, but now that I have one it's beginning to grow on me. Last but not least is a checklist. Any time I get a checklist card, I like to show them off just to see what kind of designs are used. 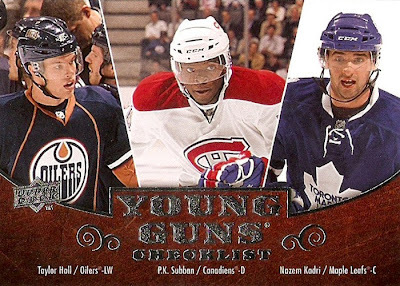 This time I got the Young Guns checklist, which is basically a horizontal version of the regular young guns. All in all, this was a pretty good break. I got a Young Gun, some inserts, and a bunch of really cool looking base cards. Not bad for something I didn't pay anything for. Surprisingly, I resisted breaking all of these on the spot, so I will be breaking them today and showing them here over the next week. Sometimes I choose cards for this series because of an excellent design and sometimes I choose them just for the photography. This card would be the latter. It's a Scott Gomez from 2001-02 Topps Stadium Club featuring an awesome action shot. There's a few things going on here. First, you've got Tomas Vokoun attempting to make a diving save on Gomez. 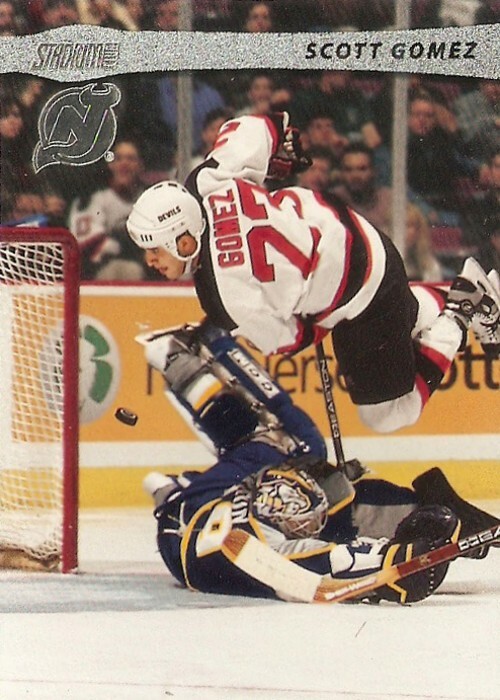 Second, and probably most noticeable, you've got Scott Gomez completely airborne. Third, you've got the puck in mid-air headed for the back of the net. As far as the design, I like the simplicity. There's a textured silver bar across the top featuring the Stadium Club text and the player name. Then there's the silver foil team logo right beneath the text. There is plenty of room left for the picture and the best part, at least on this card, is the fact that none of the design elements cover any significant portions of the picture. There is plenty of excellent photography in this set and I plan on showcasing some more of it with future picks in this series. In my mind, it's important to have goals for your collection. With the year coming to and end, I want to set some collecting goals for 2011. Card Boarded has been a great asset thus far as it's given me a place to organize and chronicle my collecting efforts. Since I started Card Boarded last December, I've accumulated quite a few cards through box breaks, pack breaks, etc. Now I need to do something with all of them, not to mention all of the cards sitting in monster boxes and binders. Everything in sorted by team right now and I want to change that. I plan on taking some time over the holidays to start reorganizing my entire collection by year and set, something I haven't done before. I've got two primary set collection projects going and I want to stay focused on them, and possibly add a third in the near future. For some reason, I find myself wanting to add another player collection to the mix. Maybe it's something about three being a nicer number than two. 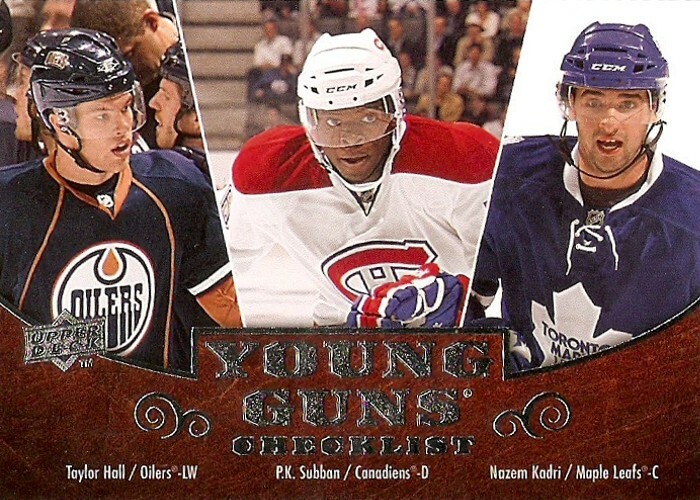 I've got a few players in mind, so I hope to narrow that list down and start this collection in the new year. Part of this has to do with organization, as I still have to get all of my traders together and get the list online. I've been to one card show in the last year. I really hope to change that now that I'm done with school and have started my working life. There's a decent sized local show coming up the weekend after Christmas and I've been planning on attending for some time now. This time I have set a budget for myself and I've got several specific things to look for, so it should be a good time. 2010 has been a good year for my collection, mostly because I got into blogging, which has given me a way to keep track of and share my growing collection. 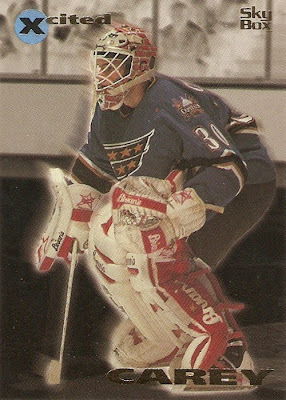 This pick is another insert from the hockey card explosion of the mid 90's. It's a Jim Carey Xcited insert from 1995-96 Sky Box Emotion. That set was different from a lot of other sets at the time and that's something that needs to come back to the hobby, everything is too much of the same thing all the time now. As far as the design, it's simple and it works. I really like how they did the negative effect on the background, which allows the player image to really stand out. The blurred effect around the player image is pretty cool too. I also like how they did something different with the name of the insert set in the upper left corner by enclosing the larger "X" inside the light blue circle. The rest of the text is nicely placed at either the top or bottom, not taking away from the image too much. The only downside is the fact that Carey's equipment went with the older Caps jerseys and didn't work too well with the blue jerseys. If only they could have used an older picture. There's nothing better than game seven of a playoff series and that is the focus of this installment of Captured on Cardboard. 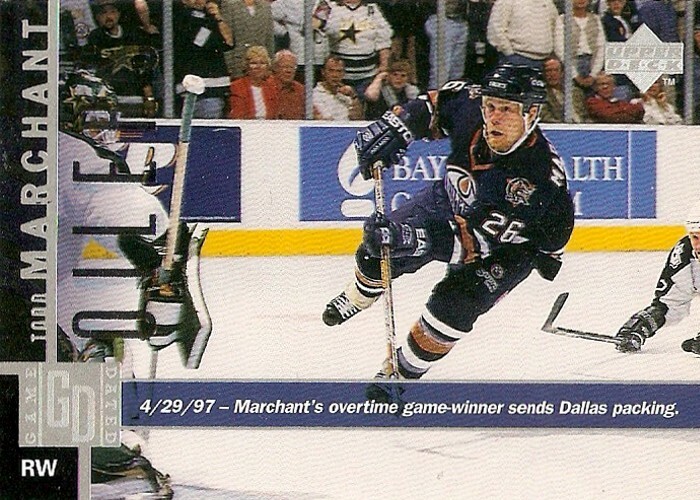 I was going through a stack of cards on my desk and came across this Todd Marchant from 97-98 Upper Deck. The caption on the card says it all. I love the photo on this card. It's the perfect picture of a breakaway, you've got the shooter against the goalie, and what makes this one even better is the defenseman diving from behind with his stick in a failed attempt to stop the scoring chance. As far as the moment that's actually being captured on cardboard here, let's take a look at the video. Around the 0:10 mark is where it looks like this photo was taken, right before the puck hits the back of the net and the Oilers defeated the Stars. Like I said in my last post in this series, the Game Dated Upper Deck card would make another appearance. 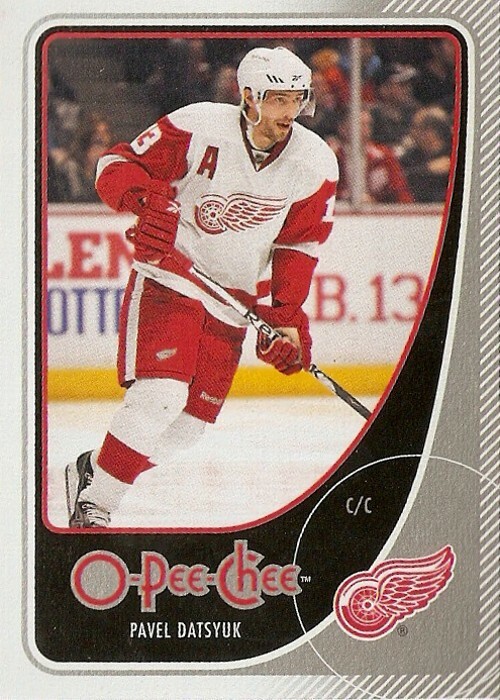 Hopefully I can find some more cards like the Franzen that aren't geared toward these kind of moments. Either way though, it's really cool to be able to pause the video when the picture was taken and look at the card side by side, especially if the photo is from a different angle than the video. 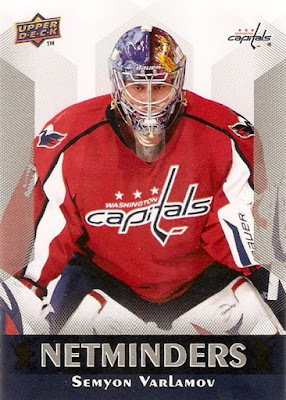 I've seen quite a few breaks of 2010-11 Upper Deck Series 1 on the forums and wanted to give it a try. I know the racks packs typically won't produce anything spectacular, but that's ok as I was just hoping to check out the base cards. 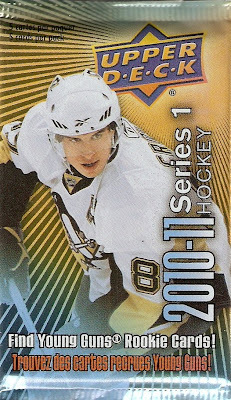 I am getting really sick of Upper Deck putting Crosby on everything. Try something else for a change (i.e. Artifacts or Black Diamond with Towes on the front). I get that he's the so-called face of hockey and what not, but come on give some other players some love. This Zetterberg is one of the better base cards from the pack. 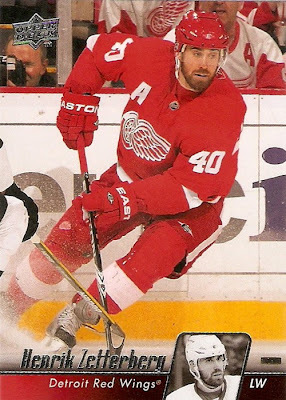 I really like the picture on this one, especially the ice flying as he is stopping with the puck. This Ryan O'Reilly is another one that stood out to me when sorting through the pack. The picture is great, a nice closeup shot of the action that's real in your face. Sometimes horizontal cards don't work too well, that wasn't the case here. 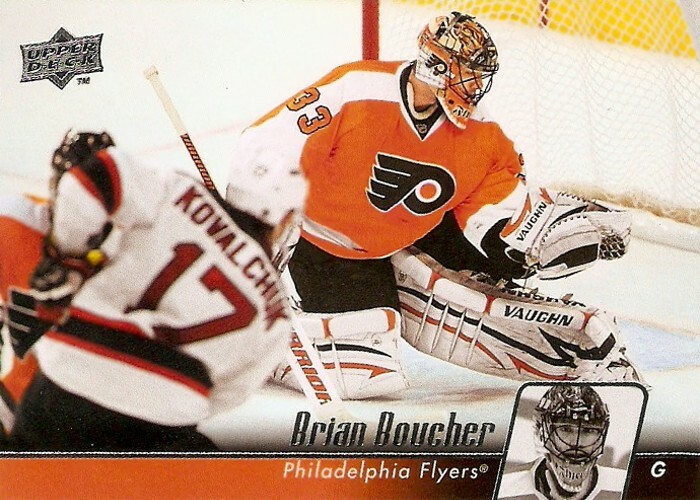 I really like this Brian Boucher. It's got a great wide action shot, with the focus on Boucher making a glove save on Kovalchuk. I always like to see how the checklists are done for a given set. 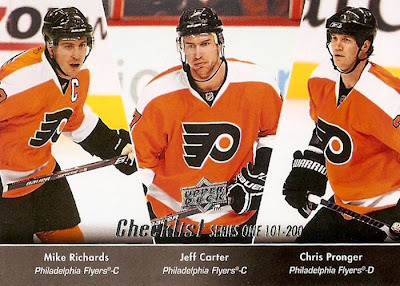 This one isn't that bad, I like how they used three players from the Hawks for the first 100 cards and the Flyers for the second 100 cards, or the two teams from last year's final. I like the idea for this insert set, but it just looks horrible. The only reason I would want another one of these is to add the Jimmy Howard from the set to my collection. Again, I like the idea of this set, but the execution is awful. It just looks like a really cheap card. I wish they would stop putting these extra inserts sets exclusively in the rack packs. The inserts from Score and Victory are better than this. All I can really say about this break is that the base cards are nice. I can't believe I've been at this for a year now. Time goes by way to fast. I stated this blog as a way to re-involve myself in the hobby and all in all, I think it's been well worth the time I've spent working on it. Since starting the blog I've gotten my collection in order and found some good general directions to take it. I've started one player collection in Jimmy Howard and continued a past collection in Dominik Hasek. 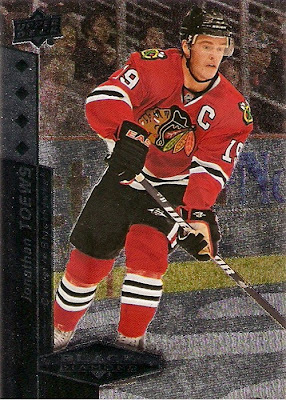 I've also started two set projects in MVP Stanley Cup Edition and Metal Universe. I've also gotten back into TTM autos. I hope to continue to build on these projects and see where they take my me. One of the best things about having this blog is getting to read other great hockey card blogs. There are plenty of good ones and great people behind each of them. 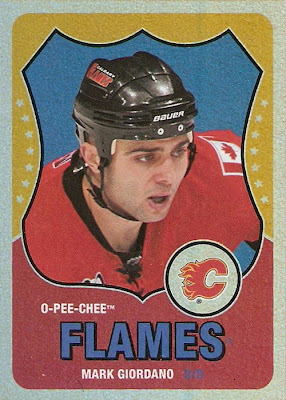 I'm looking forward to another year of blogging about hockey cards and I really want to see what happens with an ever-expanding hockey card blogoshpere. I was hoping to be able to get this posted the other day, but I had to spend the last two days in Chicago for work. Anyway, I was looking for something in the closet and came across a shoe box full of hockey pucks. Nothing out of the ordinary, as I put them there a while back when I packed up the 'hockey' shelf in my bedroom. 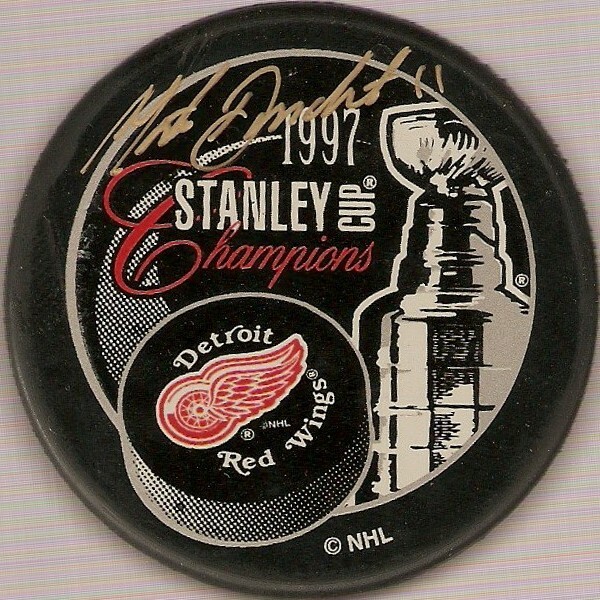 What I completely forgot about however, was the fact that a bunch of these pucks happened to be autographed. Altogether, I ended up finding 11 different signed pucks, and they all have one thing in common. The autographs are all from members of the Red Wings '97 Stanley Cup Championship team. If you can't already tell, the first one is signed by goalie Chris Osgood. 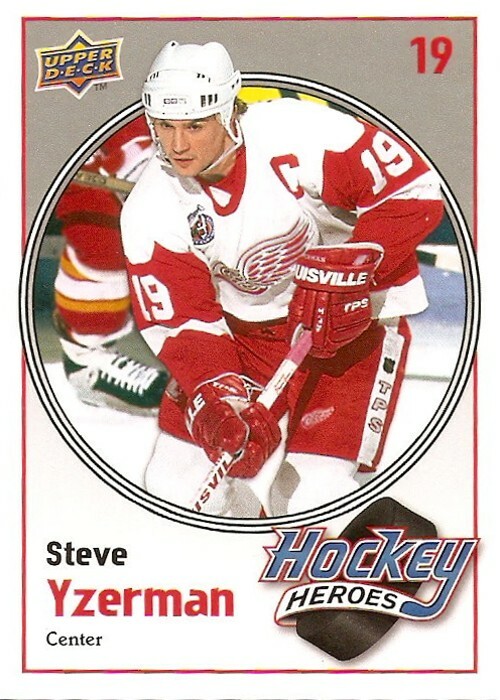 He was the go-to-guy during the 96-97 regular season, but ended up backing up Mike Vernon throughout the Stanley Cup playoffs. Vernon signed this one. He backstopped the Wings all the way to the Cup in 1997 and brought home the Conn Smythe trophy to prove it. He finished the playoffs with a record of 16-4 with one shutout. This one is signed by Darren McCarty, a member of the Grind Line and the scorer of the Cup clinching goal during the second period of Game 4 against the Flyers. That goal is one of the most spectacular ones I've seen, even ignoring the fact that it was the winning goal. This one is signed by Kirk Maltby, another member of the famous Grind Line. He appeared in 20 playoff games during the '97 Cup run, notching five goals and two assists. This puck is signed by defenseman Mathieu Dandenault. 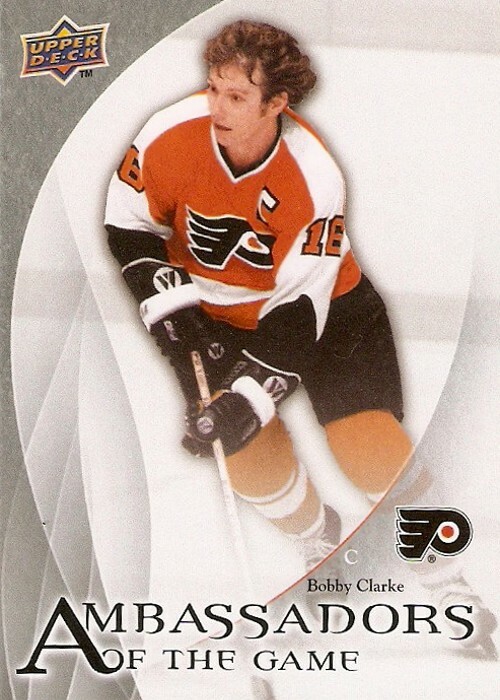 He played quite a bit during the 96-97 season, but did not make an appearance during the playoffs. This is one of the nicer autos of the bunch. 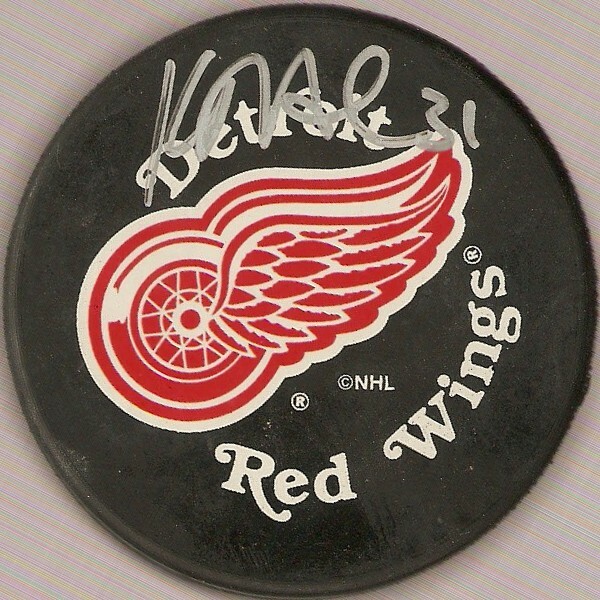 This next one is signed by goaltender Kevin Hodson. He was the third string goalie behind Osgood and Vernon, appearing in only six games during the 96-97 season and none during the playoffs. This one is signed by Doug Brown. He played 49 games during the season and also made appearances in 14 playoffs games that season notching three goals and three assists. 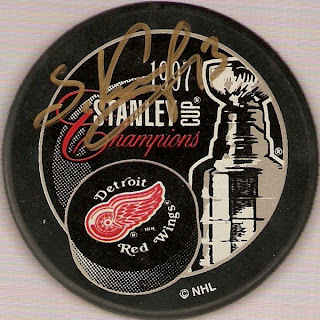 This one is signed by a member of the famous Russian Five, Slava Kozlov. 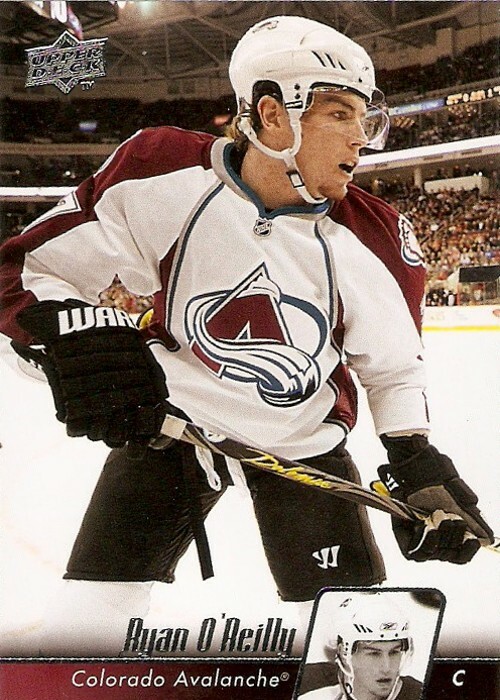 He appeared in 20 playoff games, putting up eight goals and five assists. He's got and interesting looking signature for sure. This one is signed by another guy who was part of the team, but did not actually play during the playoff run. That guy would be Mike Knuble. He played in nine games during the regular season, scoring only one goal. This puck is signed by defenseman and current Red Wings color analyst Larry Murphy. 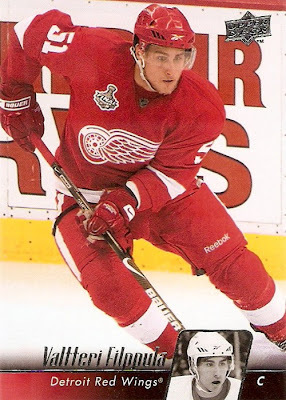 Murphy came to the Wings at the deadline that year and chipped in two goals and nine assists during the playoff run. 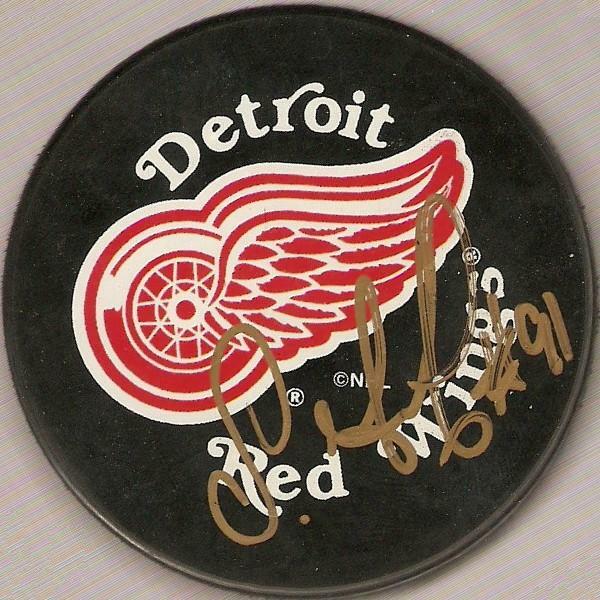 This puck is signed by one of the bigger names from that team, Sergei Fedorov, another member of the Russian Five. He notched 20 points in 20 games, eight goals and twelve assists in the playoffs. So there you have it, 11 pucks signed by members of the '97 Cup champions, pretty cool if you ask me. I haven't decided what I want to do with these yet though. I'm thinking about building some kind of puck display shelf for them. 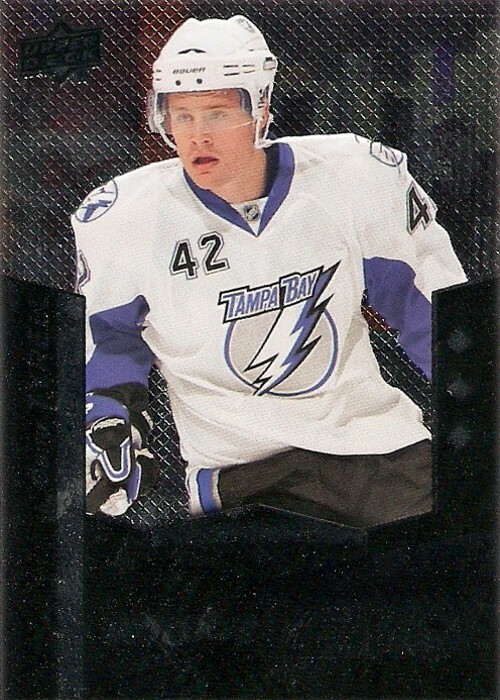 A few weeks back, for my 47th pick in this series, I highlighted an Andrei Trefilov card featuring the Sabres logo on his leg pads. 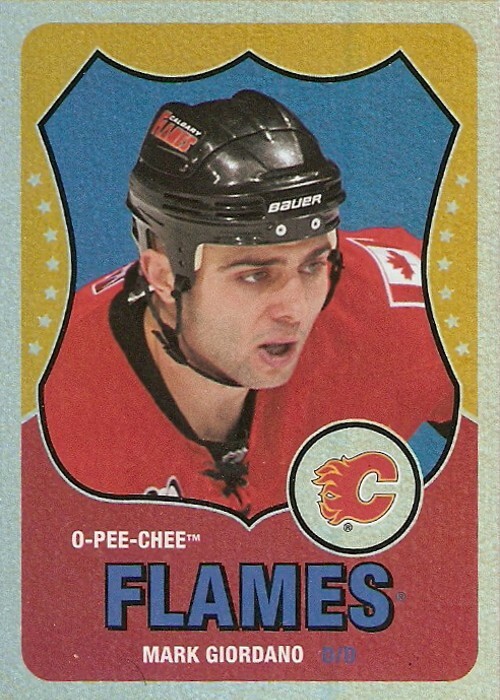 In that post, I mentioned that I had never seen that on a card before, and wouldn't you know it, I found another one. This one is a Dwayne Roloson from 1997-98 Pinnacle depicting the goaltender with the Calgary Flames. As you can see from the scan, he has the Flames logo in the same place Terfilov had the Sabres logo. 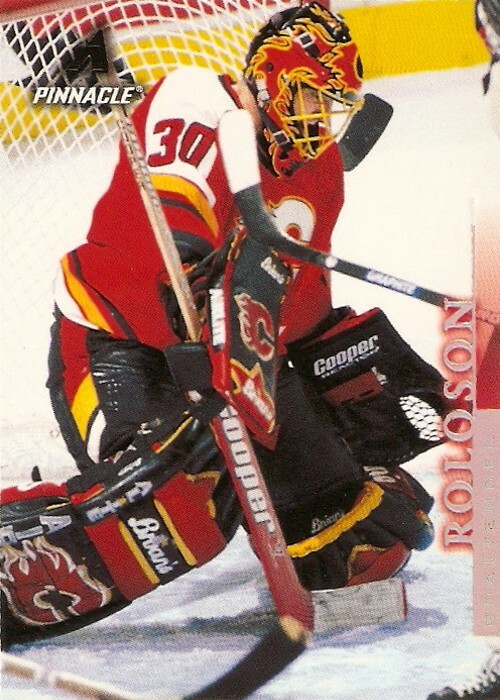 That's not all though, Roloson took it one step further with his gear. Notice his blocker? 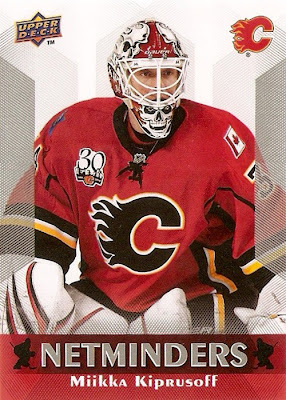 It looks like the only place he doesn't have the Flames logo is on his glove. You have to like when goalies do unique things with their equipment, even if it's something like this. As far as the design of the card, I really like this set. The Pinnacle logo is nicely placed in the corner and the vertical first name bar and last name text don't take up that much space. This leaves plenty of room for the picture, and this set definitely has some unique shots.